There’s nothing like a game with physical substance. True, some of the best pirate games around consist of nothing more than cardboard and plastic, but there’s nothing quite like those few games that forgo these modern substances in favor of metal, wood, and glass. Pieces of Ei8ht is a unique game in that it features no playing board, no cards, no dice – the only materials needed are an assortment of metal coins and a small velvet pouch. And while it might sound a trifle, there is nothing quite like hearing the jingle of these coins in their bag, the smack they make when dropped on the table, or the weight of them in your hand – these factors alone make the game so much more than it would otherwise have been. 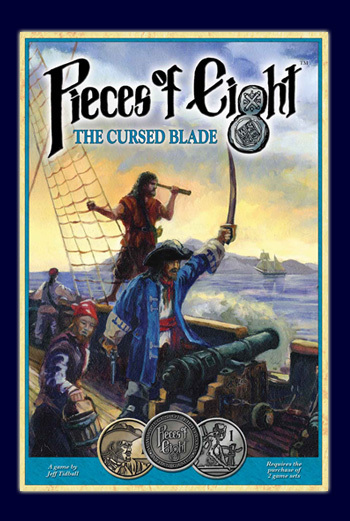 To begin the game, two or more players must each select 13 coins from their collections (one box of Pieces of Eight contains just a few more coins than needed for a single player), one of which must be a Captain coin. The remaining thirteen can be whatever combination the player feels best suits them, as each has its own function – Black Spot coins, for example, can be used to make an opponent miss their turn. A Pillage coin, alternatively, allows you to steal a coin from an opponent, and so on. 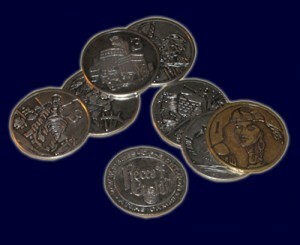 Once arranged into a “Deck” (stacked horizontally, like a loaf of sliced bread with a pirate captain in the middle), three of the coins are immediately in play – the Crow’s Nest Coin (single coin held in left hand and visible to all), the Fore Coin (forward most coin of the stack, facing outward and visible to all), and the Aft Coin (rear most coin of stack, facing inward so visible to the player alone). If this is all sounding complicated, well, it kind of is. Many games have a learning curve, and Pieces of Ei8ht is certainly no exception. Early play is not exactly intuitive, and instruction sheets must be constantly referenced to determine what coins have what powers against what other coins. Indeed, if you begin your Pieces of Ei8ht experience with an opponent as equally new to the game, prepare for several rounds of tedium. But that said, with practice and familiarity, the game begins to take on a new life entirely. Very much like playing chess, the early grind of trying to remember what pieces do what is soon replaced with rhythm, strategy, and – oh yes indeed – fun! Coins begin to instinctively move into and out of play, may be destroyed and recovered, stolen or neutralized, and on and on again. Once the initial learning curve is conquered, Pieces of Ei8ht seems a game of great possibility. The various coins can be used in countless combinations and patterns, and players can even customize their decks to better suit their prefered methods of combat (nimble and fast, or heavy and strong). As stated before, the coins themselves are a joy to handle, and also make this one of the most easily transported games around – players can easily carry it around in their pockets so they’re ready to play the moment boredom strikes. This game is not suited for the very young, but late adolescents and up may find it a compelling passtime. This entry was posted in Games and tagged atlas games by Bilgemunky. Bookmark the permalink.